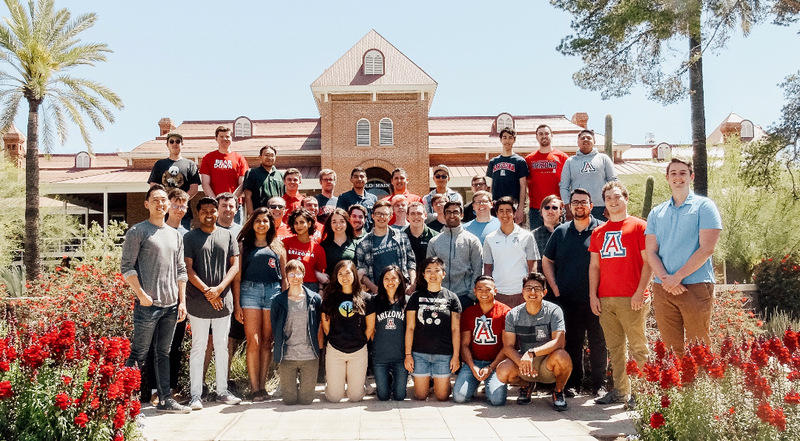 Congratulations Spring 2019 Graduating Students! Congratulations to all of the Computer Science graduating students! Your hard work and dedication has paid off and we are excited to celebrate your accomplishments! The Department of Computer Science would also like to give a big congratulations to Morgan Henry and Brandon Neth. Morgan was nominated by the Computer Science department for the Outstanding Senior Award. Brandon was nominated for the Excellence in Undergraduate Research Award. Morgan and Brandon are incredible students and very deserving of these awards. They will be receiving their awards at the College of Science Spring 2019 Awards & Recognition Reception this May. The Department of Computer Science invites all CS graduating students to participate in our graduation events this May. Graduation Lunch (student only) on Thursday, May 2 from 11:30am-1:30pm in the Gould-Simpson 9th floor Atrium. This is a casual event for graduating students where graduates will be recognized for their accomplishments while enjoying lunch with fellow graduating peers, faculty and staff. Student and Family Graduation Reception on Friday, May 10 from 3:30pm-5:30pm in the Gould-Simpson 9th floor Atrium. This is an informal event and a perfect time to get photos and share the excitement of graduation with those closest to you. Click here to RSVP for these events. The College of Science Commencement ceremony is Saturday, May 11 at 2pm in McKale Center. Students can view details, FAQs, and the commencement RSVP on the College of Science Website. Please note that the deadline to RSVP for the commencement is April 26.